You get our fantastic AX56-090-4 Series , 4 piece fly rod with a LIFETIME WARRANTY, a center disc drag die cast aluminum large arbor reel preloaded with backing, a weight forward (5 weight) floating fly line and 5X tapered leader, a rod sock, a rod case, a fly box with 9 flies and a spare leader. The rod is for 5 or 6 weight line and is great for everything from small trout and panfish to small bass. It will fish well at the local pond or on a trophy trout stream. This rod is designed by Wild Water to be very forgiving for the beginning fly caster yet sophisticated enough for an experienced angler to appreciate. When you look at the price you may need to read this a few times to believe it!! Rod Specifications: Line Weight: 5 or 6; Rod Length: 9 Feet; Number of Sections: 4; Rod Case Length: 31 Inches; Flex: Mid; Action: Slow; Material: Composite Graphite; Rod Weight: 5.7 ounces; Grip: Western; Rod Blank Color: Dark Gray; Winding Color: Black. MOST 5 STAR REVIEWS OF ANY FLY FISHING PACKAGE ON AMAZON.COM!! You won't find another 5/6 starter package out there at this price that has everything that ours has. 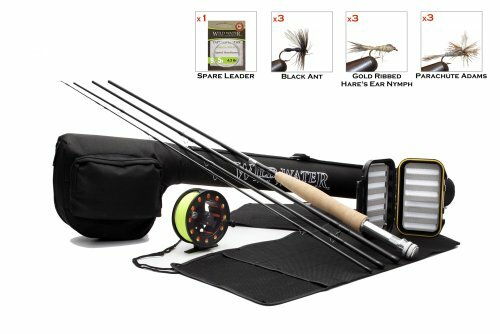 A 4-piece 9 foot rod, a large arbor reel with drag, preinstalled line, backing and leader, a rod sock, a rod case, a fly box, 3 Black Winged Ants, 3 Parachute Adams and 3 Gold Ribbed Hare's Ear Nymphs, a spare leader AND A LIFETIME ROD WARRANTY! Why settle for anything less than the BEST VALUE and BEST CUSTOMER SERVICE on the market? Buy direct from the manufacturer and get the best manufacturer-direct customer service. Not convinced? Call us at 585-967-3474 and ask us. The heart of any great fly fishing package is the rod. This one is the best! The rod is a slow action, mid flex design for making learning to cast easier. This rod has many of the same details as our more expensive HX Series rods. The case holds everything that is included in the package. A convenient zippered storage pouch on the side of the case keeps your flies and accessories from getting lost. Experienced fly casters and instructors who have tried this rod love it. You are likely to love it too!